Manila is in for a symphonic dose of Metallica classics as cello-driven Finnish band Apocalyptica will be making their way to the Philippines. Watch out for an exhilarating live performance of their iconic release, APOCALYPTICA Plays Metallica by Four Cellos (and more hits) this coming October 1, 2019 at the New Frontier Theater—an out-of-the-ordinary concert brought to you by PULP Live World. Formed in 1993 at Finland’s Sibelius Academy, Apocalyptica started out as a Metallica tribute band, making their mark and changing the landscape of heavy music with their unconventional takes on anthems by one of the world’s biggest Metal bands. Since the band’s inception, they have released eight studio albums, selling over four million copies to date, with plenty of cello-based instrumentals along with some vocal-based songs that explore various styles—“from atmospheric interludes to fast, battering rhythms.” But out of all the albums in Apocalyptica’s stellar catalogue, it’s their monumental debut that now takes the spotlight, especially after it recently hit the 20-year mark. Over two decades ago, the band came out with APOCALYPTICA Plays Metallica by Four Cellos (1996)—the instrumental opus that put them on the map. To celebrate this milestone, the world-class Finnish talents took the landmark debut release on the road (and on a Cruise), also releasing an expanded remaster of the collection. In 2018, after playing over 170 shows in 40 countries, the band put out a Live Album—APOCALYPTICA Plays Metallica by Four Cellos – A Live Performance. Recorded live in the Olavinlinna Castle, it’s a release that serves as a massive preview of what’s in store for fans, with Apocalyptica bringing their unorthodox yet highly unique and energetic live shows to more venues across the globe, for the entertainment not just of Metallica fans, or of metalheads, but that of music enthusiasts in general. Their shows are for people who seek a truly one-of-a-kind musical experience that brings together Metal and Classical—a fusion that Apocalyptica executes in the most captivating way. Prepare to witness songs like “Master of Puppets,” “Creeping Death,” “Sad But True,” “Battery,” “Seek & Destroy,” and many more performed in a way you neither imagined nor expected. 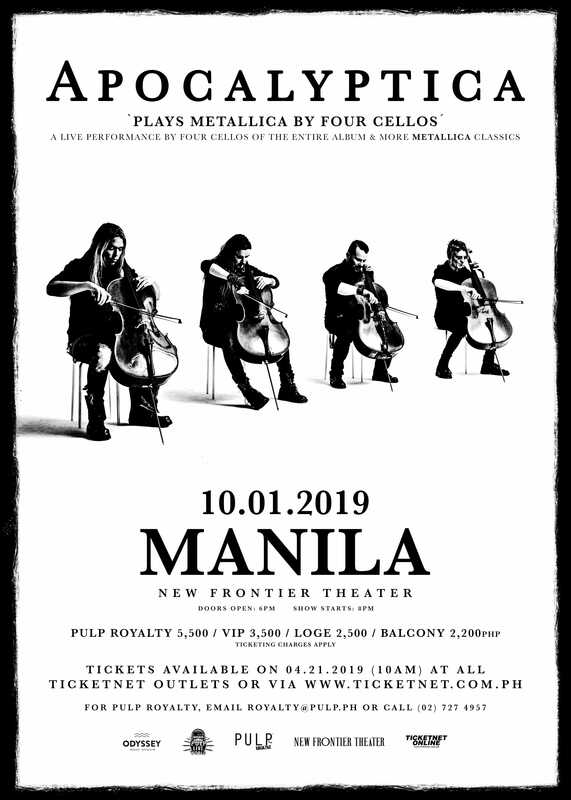 Presented by PULP Live World, Apocalyptica ‘Plays Metallica by Four Cellos’ in Manila happens on October 1, 2019 at the New Frontier Theater. Gates open at 6PM and show starts at 8PM. Tickets go on sale at all TicketNet outlets or via www.ticketnet.com.ph on April 21, 2019 (10AM). 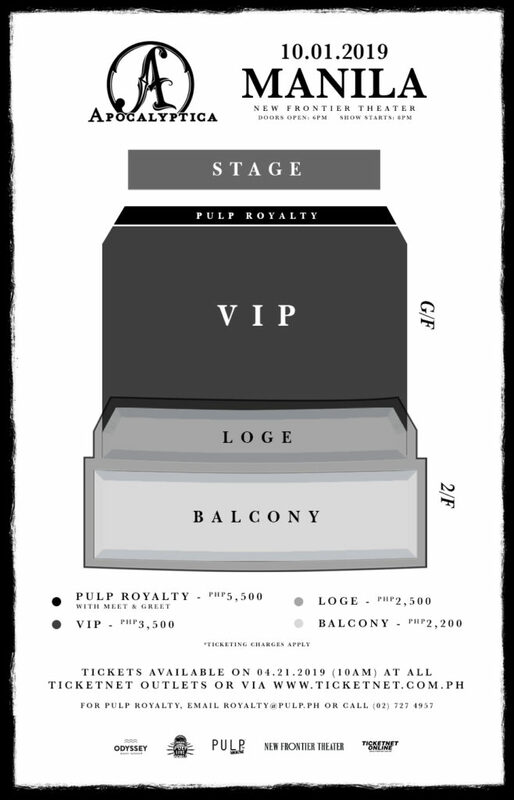 Tickets are priced as follows: PULP Royalty – P5,500 (with Meet and Greet), VIP – P3,500, Loge – P2,500, and Balcony – P2,200. Ticketing charges apply. For PULP Royalty, e-mail royalty@pulp.ph or call (02) 727-4957.